Style Source Magazine | Thickr Thickening Shampoo 13.5 oz. 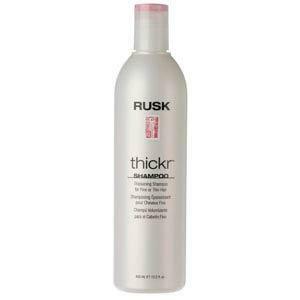 Home /	Brands / Rusk Designer Collection / Thickr Thickening Shampoo 13.5 oz. Thickr Thickening Shampoo 13.5 oz. Adds thickness, strength, lift and texture. Naturally derived ingredients in Thermplexplus dynamically bond to hair to build body and thickness in every strand. Hair is left silky, shiny and manageable. What is it? A thickening shampoo that plumps up the cuticle to increase strength, lift and texture. Who is it for? People with fine, limp, lazy hair. What does it do? Unique blend of surfactants, pH adjusters and nutrients gently cleanses the hair with a rich foam. Hair is shiny, soft and manageable. How do you use it? Apply to wet hair and lather. Rinse thoroughly. Repeat if necessary and follow with Thickr conditioner. The premier choice of hair artists around the world, Rusk styling and finishing products allow stylists to use innovative and imaginative techniques to create everything from the latest runway looks to current street fashions. 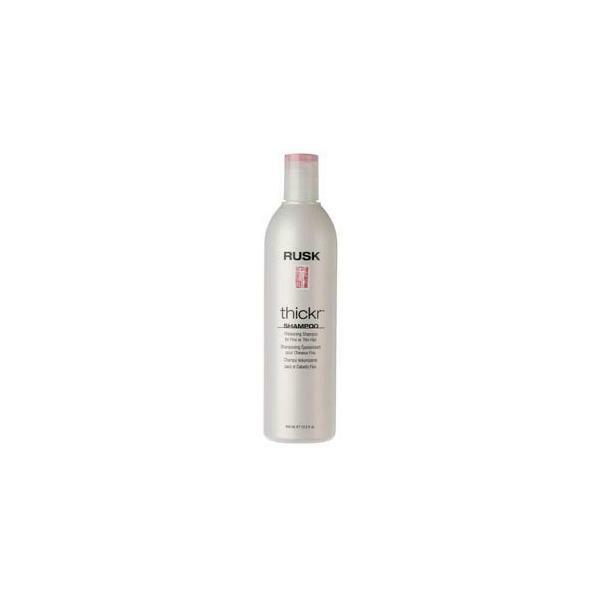 Rusk Designer Collection formulas allow stylists to manipulate the amount of body, texture, hold and control while keeping hair incredibly healthy and shiny. Thickr Thickening Conditioner 13.5 oz. Thickr Thickening Mousse 8.8 oz. Thickr Thickening Myst 6 oz.